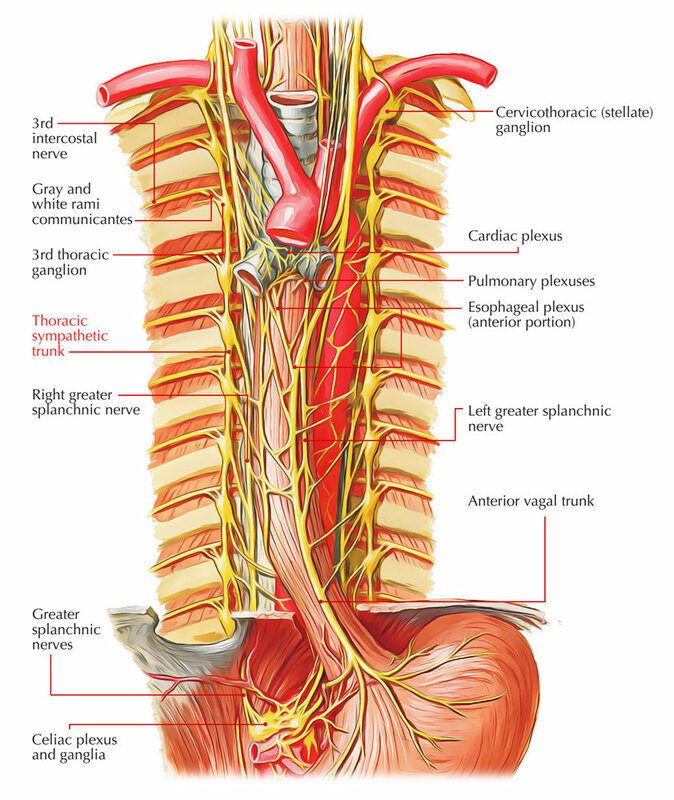 Initially, every thoracic sympathetic trunk has 12 ganglia corresponding to the 12 thoracic spinal nerves. The first ganglion commonly fuses with all the inferior cervical sympathetic ganglia to create the cervico-thoracic/stellate ganglion. The next ganglion also may occasionally fuse with the first ganglion. Thus there are generally 11 ganglia in the thoracic sympathetic trunk, sometimes there may be only 10 ganglia (vide supra). Every ganglion is located at the level of the corresponding intervertebral disc and is connected to the corresponding spinal nerve by white and grey ramus communicans. The branches of thoracic sympathetic trunks are split into 2 groups: medial and lateral. Greater splanchnic nerve: It’s created by the preganglionic fibres arising from 5th to 9th ganglia. It descends obliquely on the vertebral bodies, pierces the corresponding crus of diaphragm and ends primarily in the celiac ganglion. Partly it also ends in the aorticorenal ganglion and the suprarenal gland. Lesser splanchnic nerve: It’s created by the preganglionic fibres from 10th and 11th ganglia. It’s course is obliquely quite similar to the greater splanchnic nerve, pierces the corresponding crus of diaphragm and ends in the celiac ganglion. Least (lowest) splanchnic nerve: It’s also referred to as renal nerve. This tiny nerve originates from the 12th thoracic ganglion and may even be absent. It descends obliquely as lesser and greater splanchnic nerves, pierces either the crus or enters behind the medial arcuate ligament of diaphragm and ends in the renal plexus. The lateral branches supply limbs and body wall. Their supply is pilomotor, sudomotor, and vasomotor to the skin of these regions. The preganglionic fibres originate from the lateral horns of spinal segments and goes into the sympathetic ganglion via white rami communicantes of the spinal nerve. The preganglionic fibres from the ganglion enters again into the spinal nerve via grey rami communicantes and provide the corresponding dermatome of the upper limb and the body wall. The bilateral thoraco-abdominal sympathectomy is done to relieve severe hypertension. The surgical procedure involves removal of sympathetic trunk from T5 to L2 ganglia and excision of the splanchnic nerves. Consequently, there takes place splanchnic vasodilatation and consequent fall in the blood pressure. The upper limb sympathectomy is utilized to treat the Raynaud’s disease. In this part of thoracic sympathetic chain is excised below the level of stellate ganglion. Injury to stellate ganglion may cause ipsilateral Horner’s syndrome. Sometimes hypotension takes place during high spinal anesthesia because of paralysis of sympathetic outflow to the splanchnic nerves. The irritation of diaphragm secondary to peritonitis causes pain as a result of stimulation of the phrenic nerve (root value C3, C4, and C5). The pain is referred to the corresponding tip of shoulder, being supplied by the supraclavicular nerve (root value C3, C4, and C5).